San Andrés Fiesta :: Party on the Plaza! 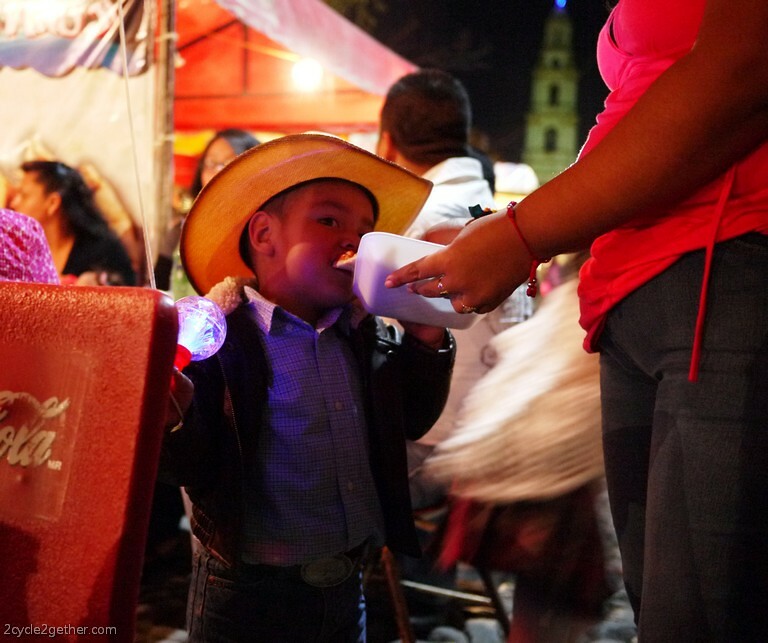 One of the things that Kai & I love about Mexico is that people here are always celebrating something. It seems like a week doesn’t go by without an event on the plaza or a parade marching through town. 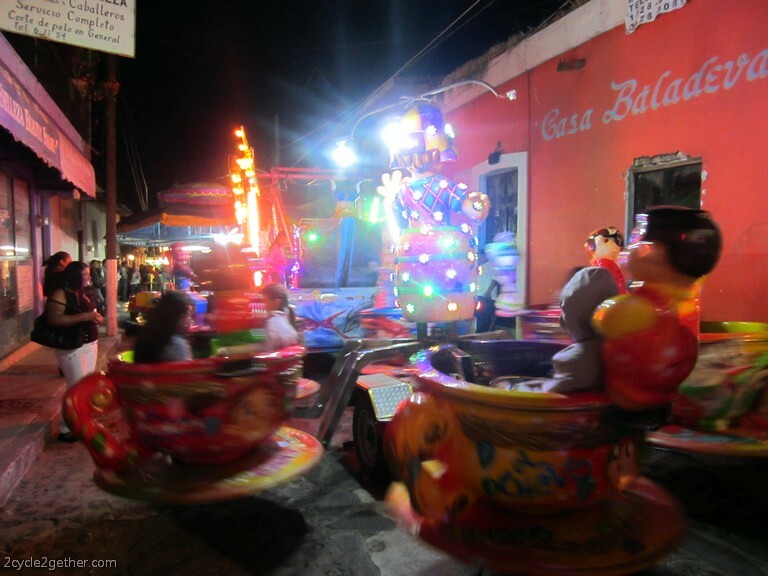 The San Andrés Fiesta, celebrated each year in November by the pueblo of Ajijic, is a great example. Each year at the end of November the town of Ajijic celebrates their patron saint Andrés, who is the Christian saint of fishermen, boats and lakes. 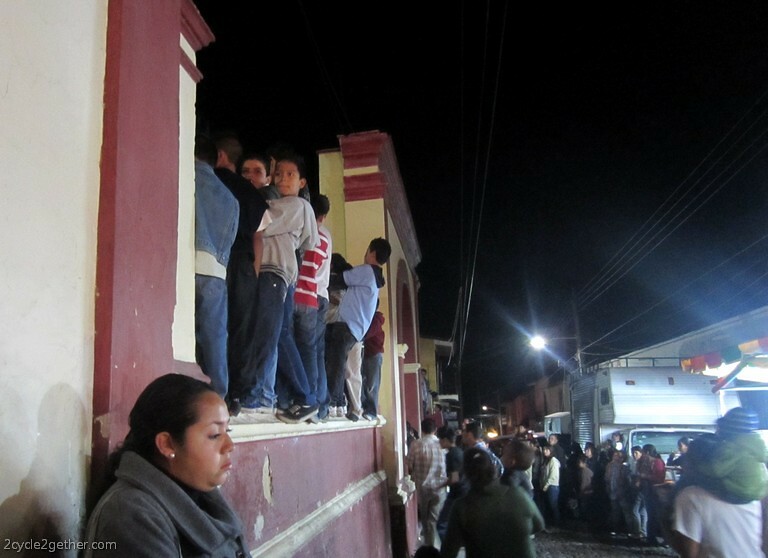 For almost two weeks the town joins together in prayer and very loud celebration. To begin the festivities, a parade of floats, each created by different neighborhoods or local organizations, is followed by a band of drums and horns as it makes it way through the narrow cobblestone streets. Especially loud cohetes (sky rockets) follow the parade and are set off every couple of minutes. This scene plays out again each and every morning – usually around 6 a.m. – for ten consecutive days. Cohetes aren’t just set off in the early morning hours though. 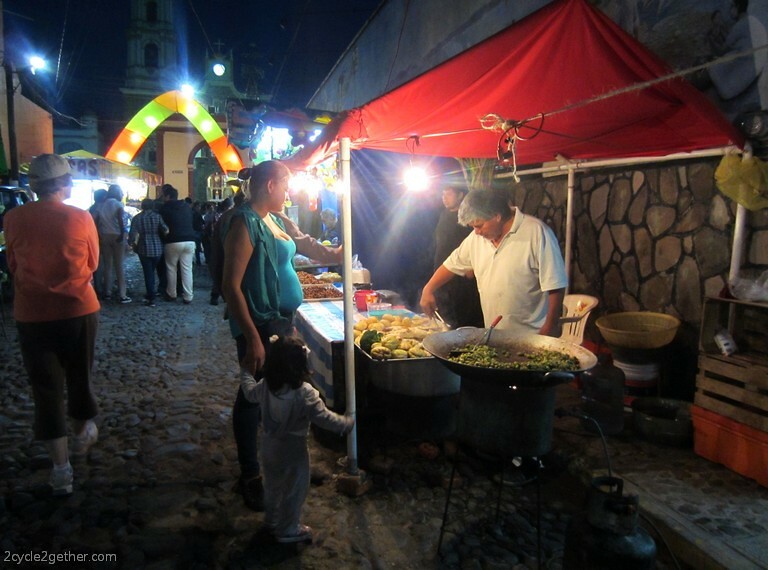 They echo off the mountains around Ajijic all day long and through the evenings as well. Each day’s events are sponsored by a local guild and at dusk the guild leads the pueblo in a candlelit parade from one end of town to the church for evening mass. 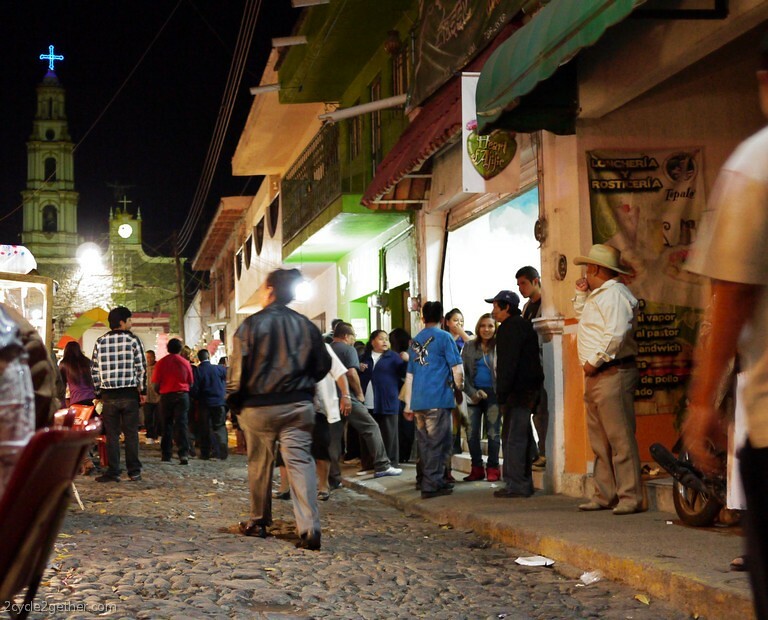 After mass, families gather at the town’s plaza, where vendors sell alcohol, food, candy, and party paraphernalia (like hollow eggs containing confetti which you break open on the top of the heads of friends and family). A travelling fair takes over the main street leading to the plaza, offering children the opportunity to ride a ferris wheel in addition to a variety of other rides. Bands play on the plaza and people dance and socialize. Families spend the entire evening there until they gather for the grand finale in the church’s atrium at around 11 o’clock. 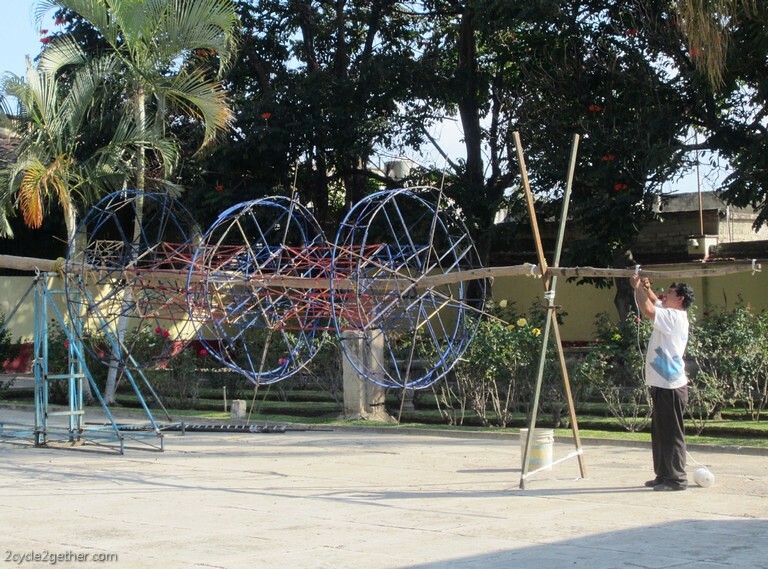 Each evening the sponsoring guild displays and lights a Castillo they created earlier that day in the courtyard of the San Andres church. 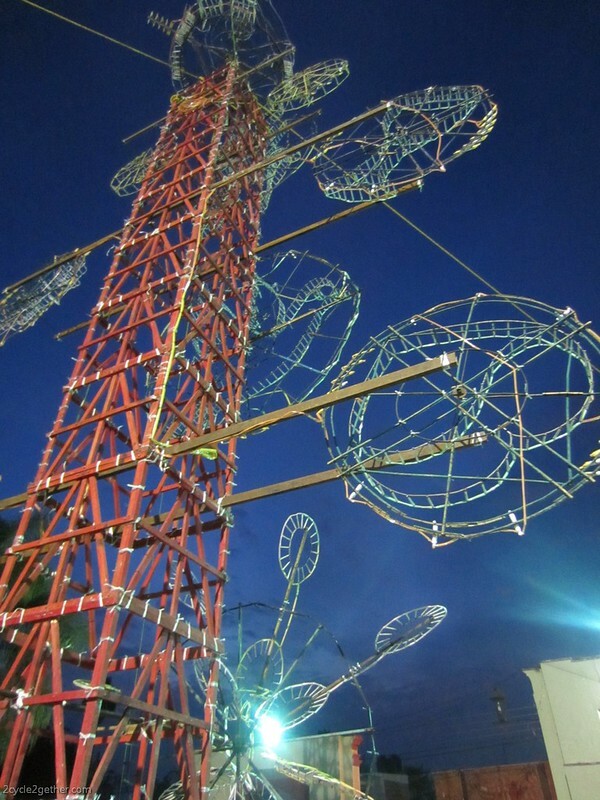 Castillos are extremely elaborate constructions in which hundreds of fireworks are painstakingly arranged on various moving parts which are then attached to a larger frame – a scaffolding of a tower made up of steel or wooden rods tied together by twine. 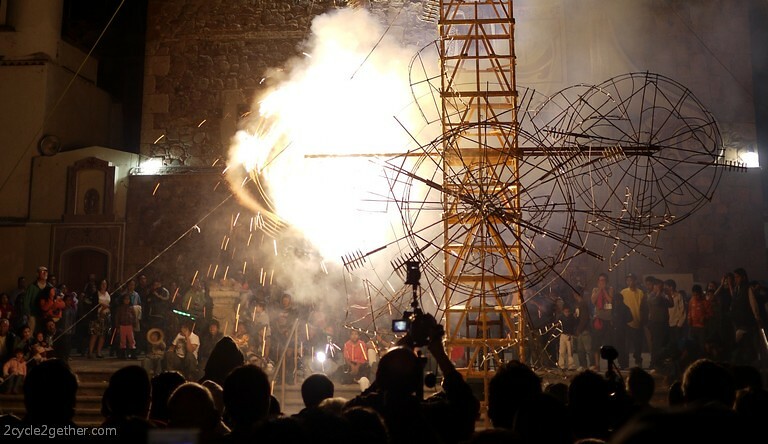 The finished Castillo, like the steeples of the church next to it, reaches toward the heavens and the crowd gathers tightly around its base in anticipation of the show. 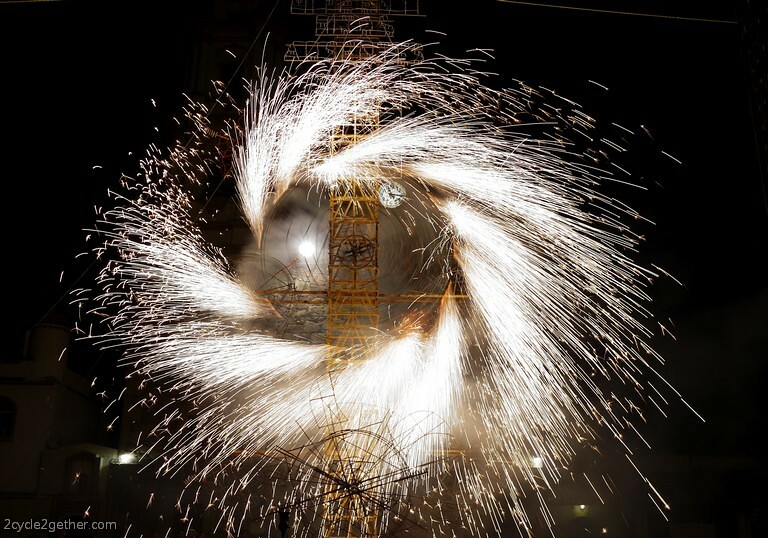 Each section’s main fuse is lit, and one by one, they twirl around and around, driven by the force of the rockets attached to them. Sparks fly out and fall over the crowd squealing with delight. As the rockets begin to slow, a brightly lit image is revealed within the center of each section. 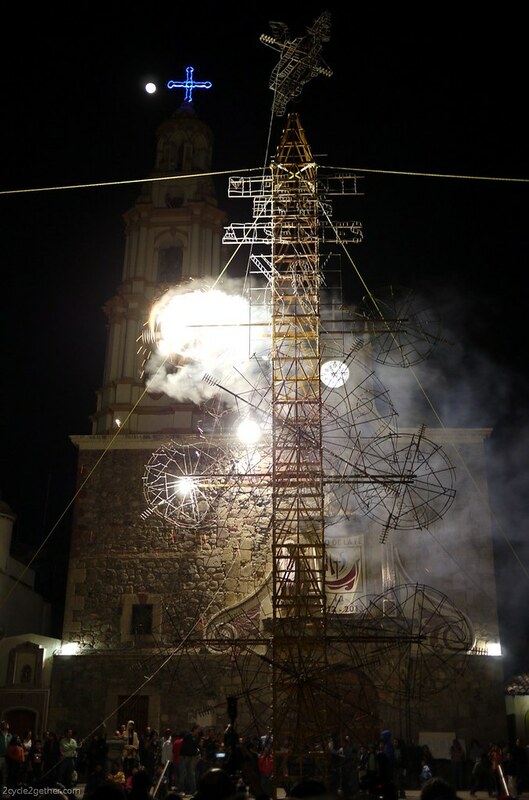 Once the final and most tippity-top section has been lit, a cornucopia of fireworks are set off in to the night sky above the church in order to officially end the day’s festivities. 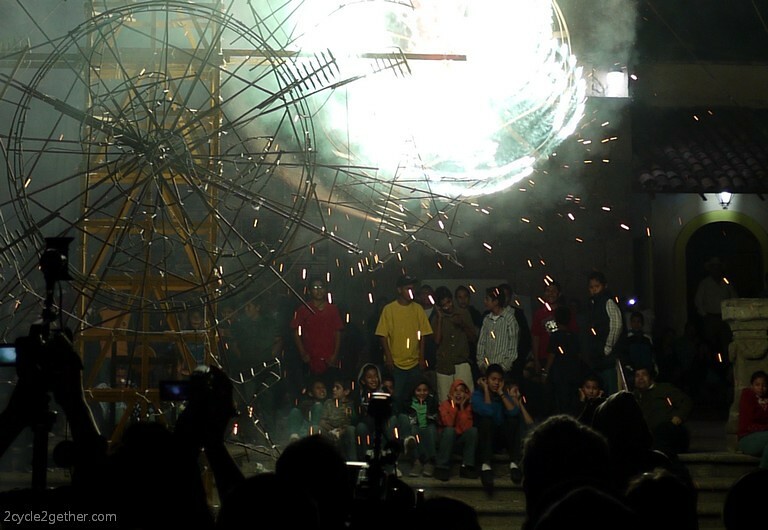 Our video below gives you a peek of Ajijic’s San Andrés Fiesta. Pay special attention to the lighting of the last moving part on the top of the Castillo – you don’t want to miss seeing the town’s hero of the evening! 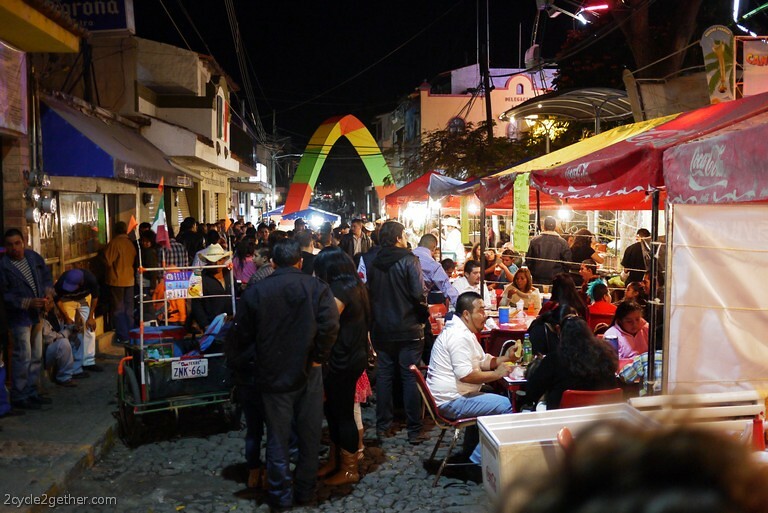 3 comments to San Andrés Fiesta :: Party on the Plaza! That giant firework tower looks both amazing and terrifying! I’d love to see one of those up close. You mentioned moving on in 2015, are you guys headed farther south or catching a boat somewhere? You’ve just reminded me why I’m super excited to go back to go back to Mexico again! Last time I was there we got invited to a Mexican wedding and it was amazing! Though I drank so much tequila, I’m not sure I can drink it again lol. Glad you guys are having fun!